The Museums in Agra rank among the popular Agra Tourist Attractions. Agra is one of the most visited tourist destinations in India and is famous for its rich tradition and heritage. 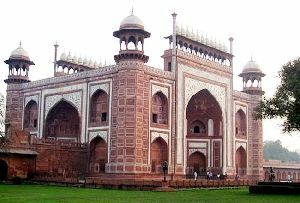 The forts, tombs and historical buildings and ancient specimens have led to the growth of a variety of museums in Agra. The Spiritual Museum, Agra is one such museum which exhibits the well known cultural and historical specimens and relics of the Mughal period. The Spiritual Museum in Agra is one of the recent museums in Agra. By visiting the Spiritual Museum, tourists get a feel of the ancient history, tradition and culture of the city. They can observe and study plenty of artifacts, historical relics and ancient specimens in the museum. The location of the Spiritual Museum Agra also makes it very popular. The museum is located within few kilometers from the spectacular Taj Mahal. Travelers who visit the Taj Mahal can come to the museum on the way. The museum is spread over a beautiful field which is surrounded by gardens and fountains. The gate of the museum is beautifully designed with a blend of traditional and modern touch. The front of the museum is designed like a shikara, which is wonderfully decorated. The museum remains open all over the week and draws hundreds of tourists. The Spiritual Museum Agra has been established by a new formed movement, which is known as the 'Brahma Kumaris'. The followers of this movement believe in the concept of the self realization of God. The interior of the museum is also beautifully decorated with a plethora of colors and designs. Various chambers of the museum provide a deep insight into the various religious beliefs and cultures in the country. At times, yoga and meditation workshops are also held here. One can easily reach the Spiritual Museum in Agra. The museum is easily accessible from the main city center by various modes of transportation. Regular bus, car and auto services are available. Plenty of tours are also undertaken to the Spiritual museum. There are half day tours and are offered by the travel agencies and the local tourist board.